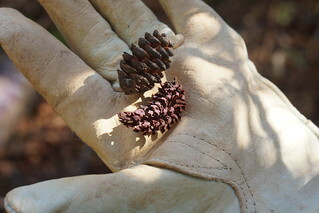 Sue Cameron from the Service’s Asheville Field Office recently joined staff from the Southern Highlands Reserve collecting red spruce cones on Pisgah National Forest, near Mount Mitchell, the highest peak in the Eastern United States. The cone collection is the first step in a multi-year process to restore red spruce to areas where it was found before the extensive logging and burning at the turn of the 20th century. The collected cones will be divided among partners who will then extract the seeds and begin growing new trees, which will eventually be planted on public lands where red spruce once grew. Planting efforts will also be focused on connecting patches of red spruce. In addition to helping conserve red spruce trees themselves, this effort will benefit wildlife, as high-elevation conifer trees are important sources of food and shelter for a variety of animals, including the endangered Carolina northern flying squirrel.